Beauty is eating a slice of freshly baked bread, with butter on it. * if you don’t have buttermilk on hand – pour juice of one lemon (juice from half of a lemon will do just fine too) into a 1 cup measuring cup – then fill remainder of cup with milk. Let stand a few minutes; use as if it’s buttermilk. Add buttermilk and stir until begins to form a ball. Knead a few times (either in bowl or on lightly floured surface) and form into a round ball. Place on ungreased baking sheet and slightly flatten. Rub gently with melted butter. Bake at 350 for about 35 minutes or until done. Super scrumptious served warm, but just as delicious not…Enjoy it – Sliced thick and toasted, smothered with butter. As French toast. Sandwiches of any sort. Why not with soup, salad and your favorite beverage? It’s an all around good recipe to keep on hand for those moments when nothing but a fresh loaf of bread will do…or your simply out of bread. 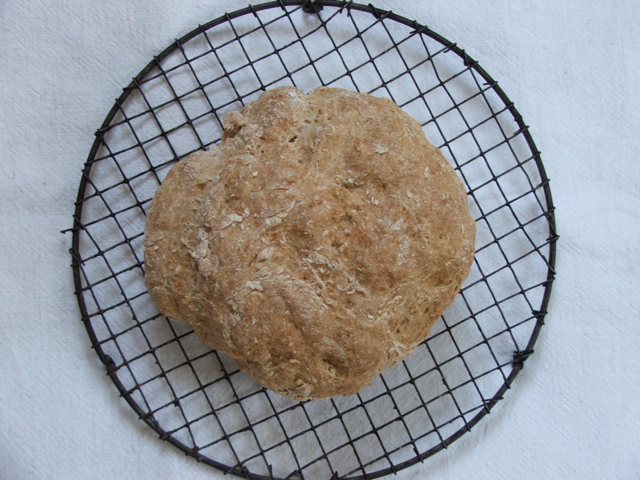 This entry was posted in baking recipes, eating, home and tagged beauty, delicious bread recipe, easy bread, irish soda bread by ripe red berries. Bookmark the permalink. This is really a surprising easy bread to make thanks for sharing. I can’t wait to try it! I’ve always shied away from breads for some reason, but this one looks simple enough for me to try. Thanks!